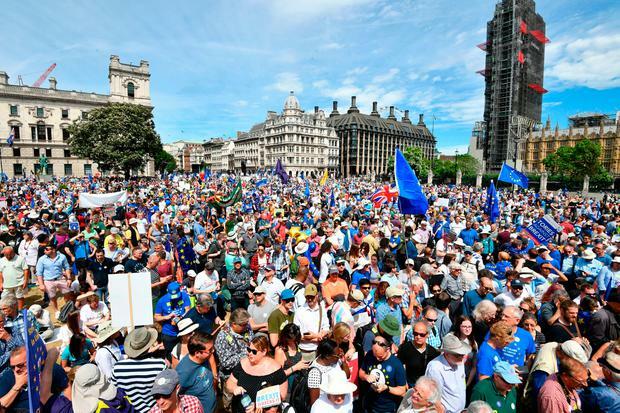 Thousands of people marched on the British parliament yesterday on the second anniversary of the UK voting to leave the EU. ‘People’s Vote’ campaigners are demanding a final ballot on any UK exit deal, saying that Brexit is “not a done deal” and people must “make their voices heard”. The march, in central London, was the biggest protest since Britain voted to leave and came as senior British cabinet ministers insisted the UK is prepared to walk away from talks without an agreement. British foreign secretary Boris Johnson urged prime minister Theresa May to deliver a “full British Brexit” as his cabinet colleagues warned the UK is able to walk away without a deal. UK international trade secretary Liam Fox said the UK was not “bluffing” about being prepared to walk away from talks with Brussels, and Brexit secretary David Davis said there is “lots going on” in preparation, in case negotiations collapse. Last week Ireland’s EU Commissioner Phil Hogan warned Mrs May about the lack of coherence in her government’s approach. “Everything I see and hear from the British media indicates they will not be in a position to bring forward proposals that will strike a deal, and they need to do so sooner rather than later because time is getting short and patience is wearing out,” he told reporters at a briefing last week. “We do have a good understanding of the problems Mrs May has to reach an agreement within her government and within her party,” he said. “I don’t think the British are in a very coherent position at the moment in terms of what they want. I don’t know how much further they can go with this type of scenario that we have today. “The big problem the EU has is that we don’t know what the UK wants and it takes two in any negotiation to reach an agreement. We are waiting a long time for the UK to tell us exactly and precisely what they want out of negotiations in order to meet the joint report that was agreed in December and which was enshrined in March in various ways at the council,” he said. Meanwhile, a shortage of qualified vets has sparked a Europe-wide recruitment drive to protect borders post-Brexit. EU officials want Ireland and other countries with ports and borders with non-EU states to increase checks on meats and food products. Veterinary border control is a key factor to ensure that live animals and animal products entering the European Union are safe and meet the specific import rules. Ireland will be key to this post-Brexit, with officials conceding more checks will have to take place on food products entering Ireland from the UK after it leaves the EU. EU sources said more vets will be needed to inspect foods coming in from the UK. “You are talking about a situation whereby the UK may in the future – say 10 years – deviate from standards like food labelling rules, pesticides or residues, either upwards or downwards. That creates a problem,” the source said. The exact number of vets needed is yet to be determined but officials in Brussels said Britain’s EU exit will put a strain on current resources. Vets work with customs officials to check products entering the EU. Veterinary Ireland, the representative body for veterinary surgeons here, has already expressed concern Brexit could destroy decades of progress made in the areas of animal and public health across the island of Ireland. Veterinary Ireland’s John O’Connor said establishing an animal health policy post-Brexit that does not diminish current standards will be very difficult.